Another South African songbird, crisp voice along with her articulate piano improvs, Thandi Ntuli passes with high marks on her debut album, The Offering. It’s been nominated for this year’s Metro FM award for Urban Jazz. For being a debut artist, she has made the daring move to produce and release her album independently of promoters, thanks to careful savings from concerts and launches in 2014. As she told one reviewer: “Releasing independently has meant I don’t have the same structures that an established record label offers its artists.” Artists in the album are talented award-winners: Sisonke Xonti (tenor saxophone), Mthunzi Mvubu (alto saxophone), Keenen Ahrends (guitar), Sphelelo Mazibuko (drums), Benjamin Jephta (double dass) and Spha Mdlalose (lead vocals). It also features a veteran of the music industry, trumpeter Marcus Wyatt. The Offering is dedicated to a late sister who died before one of Ntuli’s grand concerts, and to her grandmother, both whom were great influences in her life. At age 27 years, and a graduate of UCT’s Jazz Studies, Ntuli is not only a technical clinician at the piano (since age 4), but a soulful improviser with the aural likes of a Bheki Mseleku, using chord structures, melodies, and rhythms characteristic of spirituals, South African gospel, Afro-jazz, and American bebop. Quite an exciting melt for lovers of different jazz genres. Tinkling gospel-ish piano refrains in ‘Contemplation’, with riveting double bass solos by Jephta, and creative interpretations of rhythms all make for a gem of a song. “Um(thanda)zo’ shows off Ntuli’s lilting scatting voice accompanied by Keenan’s guitar runs. A stunning song. Wyatt’s well-known muted trumpet shines in ‘H.T.’ and ‘201 AA’. In ‘Sangare’, one hears lead vocals of another songbird, Spha, her voice following the harmonies of her team. ‘Love Remembers’ contains a lyrical sadness, thoughtfully embraced by Wyatt’s horn. 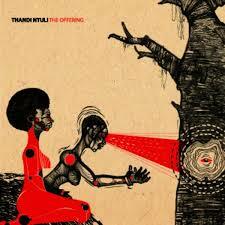 Thandi Ntuli has, indeed, offered herself to our world, and we are more blessed for that!